Density of Fresh & Hardened Concrete for Concrete Testing - The density of both fresh and hardened concrete is of interest to the engineer for numerous reasons including its effect on durability, Strength and resistance to permeability. Hardened concrete density is determined either by simple dimensional checks, followed by weighing and calculation or by weight in air / water buoyancy methods. Density of Hardened Concrete : The density of hardened concrete specimens such as cubes and cylinders can be quickly and accurately determined using a Buoyancy Balance. Buoyancy Balance : The buoyancy balance system developed by us consists of a rigid support frame. Incorporating a water tank mounted on a platform. A mechanical lifting device is used to raise the water tank through the frame height immersing the specimen suspended below the balance fixed on a cradle. 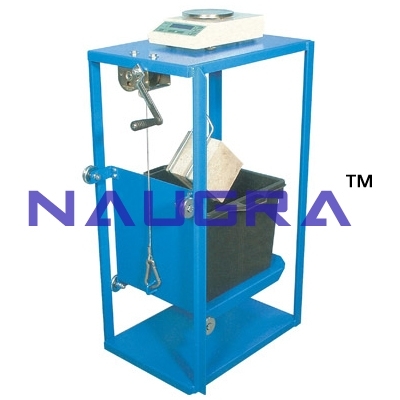 The balance supplied may also be used as a standard weighting device, thus providing a versatile and comprehensive weighing system in the laboratory. The sample is weighed in air and in water to calculate the density of fresh concrete.Used for determining the slump of fine aggregate in the determination of bulk and apparent specific gravity and absorption of fine aggregate..
We are leading manufacturers, suppliers & exporters of Density of Fresh & Hardened Concrete For Testing Lab for Concrete Testing Lab. Contact us to get high quality designed Density of Fresh & Hardened Concrete For Testing Lab for Concrete Testing Lab for schools, colleges, universities, research labs, laboratories and various industries. We accept bulk orders for government tenders in all countries around the globe.